Celebrium™ Memos are authentic digital celebrity collectibles that use patent pending technology to verify and secure their authenticity. Our Celebrity Memos are official, from the celebrities themselves, and are their own personal photos/art that they’ve authorized us to convert into a Celebrium Memo™. They cannot be authentically copied and each Memo is digitally unique regardless of appearance. You can think of Celebrium™ Memos like digital baseball cards. Collecting Memos is similar to collecting baseball cards except the collecting is done digitally using the Celebrium™ website and your Memo Vault. 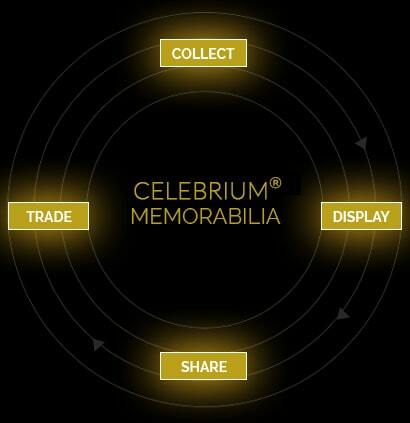 You can collect, display and trade Memos using your Vault and your Celebrium™ Collections page. Here’s how it works. Step 1: Choose the Memo(s) you want to collect and add them to your cart. Step 2: Complete your Memo purchase and your Memos will automatically appear in your Collection. Step 3: Use the online Memo Vault to track your collection or download the desktop Memo Vault to store your Memos locally on your computer and be able to store them offline. You can display your Memo collections in a few ways. Print Memo facsimiles to display in your home or office. You can trade Memos™ with other collectors using your Vault’s Export feature. Once you’ve exported the Memos you wish to trade, you’ll have a zip file containing the Memos you’ve exported. You can then send them to whomever you wish just as you would send any other digital file. You can send them using email, Skype, a file transfer service or even place them on external storage media such as a flash drive or SD card. Note: Do not use the Export feature to store a back-up of your Memos. This feature is intended for trade use only. We are currently building a feature to allow for the seamless trading of Memos using the Celebrium™ platform. More details on trading memos can be found here.